When Thomas A. Jaggar established the Hawaiian Volcano Observatory (HVO) in 1912, he could not have imagined the extent to which his pioneering studies would expand in the next 75 years. He demonstrated great foresight in setting two major research goals for the observatory: (1) the conduct of systematic, scientific studies to understand more about volcanic processes, both during and between eruptions; and (2) the practical application of research results for mitigating hazards—the forecast of impending eruptions and paths of destructive lava flows and the evaluation of all other types of volcanic hazard. The results of studies by HVO staff and other scientists have been shared with the National Park Service since 1917, when Hawaii National Park was created by Congress, and I want to emphasize that the cooperation and support of the Park Service over the ensuing years have been exceptionally helpful for our scientific work and for the benefit of the public. During these 75 years following the founding of HVO, scientists have pursued Jaggar’s original goals with great success. In addition to developing volcano-monitoring techniques now used worldwide, the observatory also has served as a training center for volcanologists from many countries, as well as for the postgraduate training of a great number and variety of USGS scientists, myself included. The lessons learned at HVO became especially valuable when Mount St. Helens erupted catastrophically in 1980, and our cadre of HVO staffers past and present were able to provide monitoring and forecasting information for that volcano, resulting in the saving of many lives. The papers in this volume reflect the greatly improved understanding of the behavior of Kīlauea and Mauna Loa Volcanoes that has been developed since the early studies in Hawaii. The structure and tectonic setting of the volcanoes, the physical and chemical properties of the eruptive products, and the history of eruptive activity over the past several thousand years have all been investigated in great detail, and the results are summarized in this book. These volcanoes have served as unique natural laboratories for the study of volcanic phenomena and the development of new monitoring instruments, and the new methods and instruments in time became standards for monitoring in most other observatories around the world. The use of sophisticated instruments led to dramatic improvements in our ability to forecast the activity of Kīlauea and Mauna Loa over the past 75 years. In particular, our ability to precisely monitor inflation–deflation cycles, the location of magma-generated microearthquakes, and volcanic tremor has moved from the subjective, intuitive stage to the level of being a science in itself. In recent decades, new technology for laser distance measuring, real-time analysis of telemetered seismic signals, and volcanic-gas analysis have greatly improved our forecasting capability. Currently we are pursuing new applications of computers to all the problems of volcano monitoring, including the generation of three-dimensional models of the volcanic “plumbing systems” for Kilauea and Mama Loa. All these exciting scientific accomplishments, though nourished by improved technology, have in fact been linked by a continuing thread of human ingenuity and dedication to science such as characterized the earliest work of Thomas Jaggar. His achievements and those of the people who succeeded him demonstrate the critical importance of individual imagination and creativity in earth-science research. I take great pride and personal pleasure in presenting these results of 75 years of research in Hawaiian volcanism to the scientific community and the public. From this link, you can search for and order a Print-on-Demand quadrangle(s). 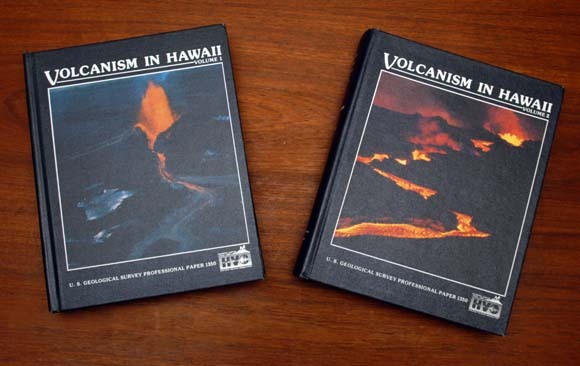 Edited by Decker, Robert W., Wright, Thomas L., Stauffer, Peter H., 1987, Volcanism in Hawaii: U.S. Geological Survey Professional Paper 1350, 1667 pp., https://pubs.usgs.gov/pp/1987/1350/.